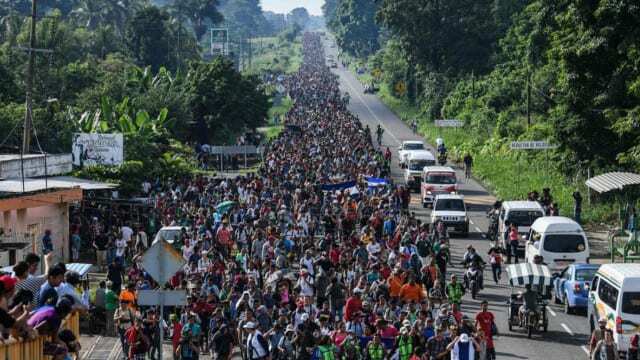 Marching inexorably towards our southern border is a mass of humanity, planned, coordinated, and choreographed by the Democrat Party as nothing more than a voter registration drive consisting of the wretched refuse from Latin America. Since there simply aren’t enough cemeteries to provide the winning margin Democrats need in future elections they have had to resort to even more creative ways of increasing their voting bloc. Regardless of the cost to our nation. And also with apparent disregard for the safety and human dignity of the illegal immigrants they have encouraged to make the arduous and dangerous trek across three countries to reach the land of milk and honey, the United States. So what’s going to happen when they finally reach our southern border? Well we can all talk tough but realistically if the Honduran invasion reaches the Rio Grande River we will not use force and violence to stop them from bum-rushing our border and entering into the United States. Which is exactly what they’ve been instructed to do by their sponsors, since they’ve also been assured that no violence will be used against them. It’s certain that they will be joined and accompanied by dozens of television cameras, the news media, Democrat politicians, Hollywood personalities, and likely dozens of lawyers and other leftists and liberal activists. It will be politically impossible for the Trump Administration to stop this from happening. The American public simply doesn’t have the stomach for harsh measures being used, not to mention broadcast on television around the world. The United Nations and the rest of the world will denounce any force that’s used, and we will be powerless to stop a mass of humanity entering the country and spreading out, just like the Syrian ‘refugees’ did to Europe. The best we can hope to do is have the guts to quickly round up as many as we can and waive any deportation hearing, treating them as enemy invaders instead of as asylum seekers. And most importantly we must immediately deport them back to their country of origin by the most expeditious means possible. That will be a whole lot cheaper for the American taxpayer. What also needs to be done is to investigate fully how this was planned, organized, and choreographed, and whomever was responsible or involved needs to be prosecuted to the fullest extent possible. There are plenty of federal statutes that can be brought to bear on any American citizen who is or was involved. One likely need look no further than Barack Obama and Valeria Jarrett and their OFA (Organizing For America) organization as the behind the scenes instigators and coordinators of this invasion, with the funding coming from the George Soros organization. The Democrat Party must also bear responsibility for what is taking place and be held accountable by the legal voters of America. There is another solution that should be considered in the event that these invaders cannot be quickly removed from the country and deported back to from where they came. Since the Democrats will surely call for them being welcomed as just another group of “dreamers” looking for a better life in America, the answer is really pretty simple. All of the illegal aliens not removed should be immediately placed to live within the Congressional districts that Democrats have held electoral control over for decades. One would think that California Democrat Nancy Pelosi surely will welcome many of them into her Congressional district. Just as Democrat Maxine Waters would be expected to put out the welcome mat for them as well. Democrats then won’t have to troll cemeteries nearly as much for votes in future elections, and the new Democrats from Honduras and elsewhere in Latin America will be kept in Congressional districts that have been securely in the hands of the Democrat Party for years so it won’t matter. Not the ideal solution, but better than allowing the invaders and the Democrats to expand to other areas where they just aren’t welcome by real Americans anymore.